7th lunar month of 1695: first-recorded performance, in Kyôto at Miyako Mandayû's theater; he plays under the name of Ôtori Kurôji the role of Kumazawa Tôta in the drama "Shitennô Masu Kagami". 11th lunar month of 1696: Kurôji plays in Kyôto at Hayagumo Chôdayû's theater the role of Kumagawa Tôta in the drama "Fukujumaru", which is produced by Yamashita Hanzaemon I. Fall 1699: Kurôji and Uemura Kichisaburô I go together to Edo. 11th lunar month of 1699: Kurôji performs at the Moritaza in the drama "Tôsei Okuni Kabuki". Fall 1708: Kurôji goes back to Ôsaka. 11th lunar month of 1708: he becomes jitsuaku and takes the name of Ôtori Michiemon in Ôsaka, performing in the kaomise drama "Ôkamado Uke Matsuri", which is produced in Ôsaka by Iwai Hanshirô II. 11th lunar month of 1709: Michiemon performs in Ôsaka at Shioya Kuroemon's theater in the kaomise "Inari Chôja Kokonotsu Kogura", which is produced by Iwai Hanshirô II. 3rd lunar month of 1710: Michiemon's rank in the Ôsaka hyôbanki, jitsuaku section, is jô (superior). 11th lunar month of 1710: Michiemon performs in Ôsaka in the kaomise drama "Shusse Yakushi Jûnishin", which is produced by Arashi Sanjûrô I. 11th lunar month of 1712: Michiemon performs in Ôsaka in the kaomise drama "Mikawa no Kuni Yatsuhashi no Kura Saiwai Chôja", which is produced by Arashi Sanjûrô I. 3rd lunar month of 1713: Michiemon's rank in the Ôsaka hyôbanki, jitsuaku section, is jô-jô-(shiro)kichi (superior - superior - (white) excellent). 11th lunar month of 1713: Michiemon plays in Ôsaka the role of Ôgiku Danjô in the kaomise drama "Ôminato Kogane no Izumi", which is produced by Yamamoto Hikogorô. 2nd lunar month of 1714: Michiemon's rank in the Ôsaka hyôbanki, jitsuaku section, is jô-jô-kichi (superior - superior - excellent). 1st lunar month (spring?) of 1715: first Kabuki adaptation of Chikamatsu Monzaemon's drama "Daikyôji Mukashi Goyomi", which is entitled "Daikyôji" and is staged in Ôsaka; Michiemon plays the role of Sukeshichi [casting]. 11th lunar month of 1715: Michiemon performs in Ôsaka in the kaomise drama "Saiwai Mochimaru Chôja", which celebrates the shûmei of Iwai Hanshirô III. 11th lunar month of 1717: Michiemon plays in Ôsaka at the Kado no Shibai the role of Ôe no Hyôgo (a role popularized by Kataoka Nizaemon I in Kyôto) in the kaomise drama "Benten Chôja Uga no Tama", which was produced by Ogino Kinnojô. 11th lunar month of 1718: Michiemon performs at the Naka no Shibai in the kaomise drama "Sumiyoshi Tanjôseki", which is produced by Takeshima Kôzaemon II. 1st lunar month of 1719: Michiemon's rank in the Ôsaka hyôbanki, jitsuaku section, is jô-jô-(shiro)kichi (superior - superior - (white) excellent). 11th lunar month of 1722: Michiemon plays at the Ônishi no Shibai the role of Tetsuemon in the kaomise drama "Genji Moyô Ichimai Gushi", which is produced by Yamatoyama Jinzaemon II (who celebrates his shûmei). 11th lunar month of 1723: Michiemon becomes katakiyaku and performs at the Ônishi no Shibai the role of Hôshôji Kandayû in the kaomise drama "Fukujukai Kogane no Minato", which is produced by Sakakiyama Shirotarô I. 1st lunar month of 1724: Michiemon's rank in the Ôsaka hyôbanki, katakiyaku section, is jô-jô-kichi (superior - superior - excellent). He plays in the same theater the role of Taira no Masamori in the new year drama "Kôkiden Uwanari Guruma". Fall 1725: Michiemon goes to Kyôto. 11th lunar month of 1725: Michiemon becomes jitsuaku and plays the role of Hideemon in the kaomise drama "Sanpukutsui Eiga no Shikishi". 1st lunar month of 1726: Michiemon's rank in the Kyôto hyôbanki, jitsuaku section, falls to jô-jô-hankichi (superior - superior - half excellent). 2nd lunar month of 1726: Michiemon plays in the same theater the role of Okuzaemon in the new year drama "Keisei Ise Monogatari". 3rd lunar month of 1726: Michiemon's rank in the Kyôto hyôbanki, jitsuaku section, falls to jô-jô (superior - superior). Fall 1726: he falls seriously ill and has to stop acting for several years. 2nd lunar month of 1729: Michiemon is temporarily back on stage as a jitsuaku to play the role of the karô Usami Genba in the kaomise drama "Wakatake Ôshimadai", which is produced by Takeshima Kôzaemon III. 3rd lunar month of 1729: Michiemon's rank in the Ôsaka hyôbanki, jitsuaku section, is jô-jô-(shiro)kichi (superior - superior - (white) excellent). 6th lunar month of 1732 ~ 1734: tour in Ise and long stay in Nagoya; Michiemon's travelling and stage partners are Fujioka Daikichi, Ogino Yaegiri I, Arashi Sanjûrô I, Sakakiyama Fujisaburô, Tatsuoka Someemon, Sawamura Sôgorô I, Sagawa Bunzô II, Fukuda Dan'emon, Tamiya Shirogorô and Matsushima Hyôtarô. No record afterwards. 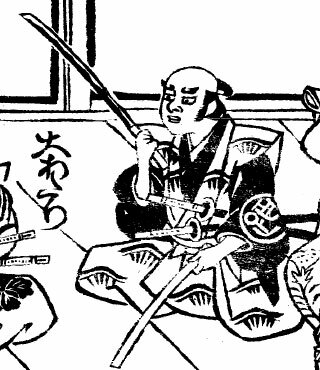 Ôtori Michiemon was a Kamigata jitsuaku/katakiyaku who spent 9 years in Edo in his prime and achieved fame for himself in Ôsaka from the end of the 1700s to the middle of the 1720s. His ranking had its ups and downs due to health issues.